LAS VEGAS, Nev.— Former Washington Department of Ecology regulator Ron Skinnarland has joined Longenecker as an associate, broadening L&A’s regulatory innovation team with his more than two decades of experience in regulating the Hanford site. Skinnarland, who most recently served as Ecology’s Waste Management Section Manager, joins a powerful team of former regulators at L&A, including former South Carolina Department of Health and Environmental Control federal facilities liaison Shelly Wilson, former New Mexico Environment Department Resource Protection Division Director Kathryn Roberts and former Nevada Department of Conservation and Natural Resources Director Leo Drozdoff. During his 30 years at Ecology, Ron spent more than two decades leading the Waste Management Section, where he was responsible for regulatory oversight and cleanup of Hanford solid and liquid waste treatment, storage and disposal facilities, Hanford Low Level Burial Grounds, Plutonium Finishing Plant, PUREX and PUREX Tunnels, B Plant, T Plant, 300 Area Building D & D, N/D/DR/ and H Reactors. He negotiated the consent decree for interim stabilization of Hanford’s single shell tanks and led Tri-Party Agreement negotiations for Hanford tank waste treatment and disposal. Ron also served as a principal interface manager between Ecology, USDOE, EPA, contractors, other agencies, Hanford Advisory Board, tribes, stakeholders, media and the public. He holds Master of Public Administration and Master of Business Administration from York University and a Bachelor of Applied Science/Industrial Engineering from the University of Toronto. LAS VEGAS, Nev.— Former South Carolina Department of Health and Environmental Control federal facilities liaison Shelly Wilson has joined Longenecker & Associates as a senior regulatory specialist, the company announced this week. Wilson, an expert in Resource Conservation and Recovery Act (RCRA) compliance, highlevel radioactive tank closure and innovative regulatory strategy, retired from SC DHEC in February. During her time at DHEC, Shelly provided regulatory oversight of the Savannah River Site and created and managed DHEC’s strategy to work with all responsible parties and stakeholders for timely closure of the most recent six SRS high-level waste tanks, all without appeal. The approach integrated all regulatory authorities and processes into one common closure plan decision for each tank, including EPA and NRC consultation. Shelly was appointed by Secretary of Energy Rick Perry to the Environmental Management Advisory Board (EMAB) in 2018. She holds a Bachelor of Science in Engineering from the University of South Carolina. LAS VEGAS, Nev.— The Nevada Test Site Historical Foundation, which oversees the National Atomic Test Museum in Las Vegas, has elected Longenecker & Associates President John Longenecker as the new Chairman of its Board of Trustees. John will succeed his long-time friend and mentor, Troy Wade, who chaired the board after a long and distinguished career at the Department of Energy that culminated in his appointment as Assistant Secretary for Defense Programs. Before founding Longenecker & Associates three decades ago, John served in the Reagan Administration as the Deputy Assistant Secretary for Uranium Enrichment in the U.S. Department of Energy. Prior to managing the U.S. uranium enrichment enterprise, John held other management positions in DOE and its predecessor agencies. John has spent several years as a Trustee of the Nevada Test Site Historical Foundation and is a member of the board’s Development Committee. The mission of the Nevada Test Site Historical Foundation is to preserve and foster public accessibility to the history associated with the Nevada Test Site and the nation’s nuclear weapons testing program. The NTS Foundation promotes and supports cultural, educational, and scientific programming to encourage the development and public exchange of views regarding the Nevada Test Site and its impact on the nation. LAS VEGAS, Nev.— Longenecker & Associates, Inc. is expanding the National Nuclear Security Administration and U.S. Air Force expertise on its advisory board with the addition of Maj. Gen. Sandra Finan (USAF ret.) and former Honeywell Federal Manufacturing & Technologies President Chris Gentile, the company announced today. The newest members of L&A’s advisory board will provide expert strategic perspective and participate in governance reviews of L&A’s expanding portfolio of NNSA work, which now includes Los Alamos National Laboratory as an integrated part of the Triad team managing the lab as of Nov. 1. L&A’s other key NNSA projects include Sandia National Laboratories, where L&A is an integrated small business subcontractor, the Nevada National Security Site, where L&A is an integrated part of the SOC-led protective forces team, and direct support to NNSA both in the field and at headquarters. Finan’s last duty assignment was as the Office of the Secretary of Defense’s Deputy Chief Information Officer for Command, Control, Communications, Computers & Information Infrastructure Capabilities, where she set strategy and policies for design, architecture, security, cyber security, interoperability, and sustainment of critical nuclear/non-nuclear communications capabilities including governance, product development, deployment, and operational processes. LAS VEGAS, Nev.— Longenecker & Associates, Inc. announced today that Department of Energy and National Nuclear Security Administration (NNSA) veteran George Rael has joined the company as Project Manager for L&A’s Los Alamos National Laboratory (LANL) portfolio. In his new role, Rael will oversee L&A’s work as part of the Triad National Security LLC team selected by the NNSA earlier this year to manage Los Alamos National Laboratory. Triad will formally take over management of LANL in November after transition is complete. L&A is an integrated part of the Triad team, providing a range of technical mission enhancing functions, quality assurance support and integration, contractor assurance, regulatory support and integration, and capital project/project delivery support. With a federal career that spans more than three decades, George has deep experience at Los Alamos supporting both the national security and environmental missions at the site. Before retiring in 2014, George held a number of leadership positions at the NNSA Los Alamos Field Office, most recently serving as Assistant Manager for National Security Missions. Prior to that, George served as Assistant Manager for the Environmental Projects Office at the Los Alamos Field Office and Manager of the Environmental Programs Department at the NNSA Service Center in Albuquerque. He will work in close coordination with L&A’s existing Los Alamos Legacy Cleanup Contract Project Managers and staff. George holds a Bachelor’s Degree in Civil Engineering from New Mexico State University and has excelled in numerous project management leadership positions. LAS VEGAS, Nev.— Longenecker & Associates, Inc. announced today that James Veres has joined the company as Chief Financial Officer and Vice President for Business Operations. In his new role, Veres will oversee the day-to-day financial management of L&A, supporting the company’s growing portfolio of projects in mission assurance, project delivery and business operations across the Department of Energy and National Nuclear Security Administration enterprise. James has more than 30 years of experience in leading financial, contract management, human capital and other business management functions for small businesses operating in the DOE market, most recently at BCS, where he has been the Chief Financial Officer since 2011. Prior to that, he was a partner at IBM following its acquisition of National Interest Security Company, where he was a senior vice president. James served as Chief Financial Officer for Technology and Management Services, Inc. (TMS) prior to its acquisition by National Interest Security Company in 2007. James holds a Master’s Degree in Information Technology Management from Johns Hopkins University and a Bachelor’s Degree in Finance and Management from the University of Steubenville. 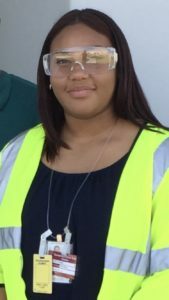 Ms. Caitlyn Gray, a sophomore Electrical Engineering student at South Carolina State University (SCSU), completed a summer internship supporting L&A activities at various sites. Her assignments focused on quality assurance and cost engineering at the Salt Waste Processing Facility at the Savannah River Site (SRS) along with Primavera P6 scheduling of project activities at Lawrence Berkeley National Lab and the Waste Isolation Pilot Plant. Caitlyn also represented L&A at a briefing by DOE of current challenges associated with running SRS. She met with and directly interfaced with a number of DOE and NNSA managers in order to better understand what their needs were at SRS. LAS VEGAS, Nev.— Longenecker & Associates, Inc. announced today that Teri Browdy, a senior executive with broad project experience across the Department of Energy enterprise, has joined the company as Group Vice President for Project Delivery. From 2006 to 2017, Browdy worked in a number of capacities for Nevada National Security Site M&O contractor NSTec, ultimately serving as Director of the Environmental and Waste Management Directorate. In that role, Browdy was responsible for more than 200 personnel and up to $95 million in annual budget. After the transition to new NNSS contractor Mission Support and Test Services, LLC in 2017, Browdy served as Chief of Staff to the Mission Execution organization, providing assistance in managing daily operations of $300 million in annual budget and execution of Incident Prevention & Response for emergency responders around the world; Stockpile Stewardship of Nuclear Weapons and testing of the nuclear stockpile; and Environmental Restoration and Waste Management operations for the DOE and DoD complex. LAS VEGAS, Nev.—Longenecker & Associates, Inc. announced today that Mike Briggs, a senior executive with broad experience in nuclear operations and nuclear safety across the Department of Energy complex and abroad, has joined the company as Senior Program Manager for Operational Support. Prior to joining L&A, Mike worked for BWXT and its predecessor companies for more than a decade, serving as the lead for Safety, Industrial Hygiene, Radiation Protection and Occupational Medicine at WIPP M&O contractor Nuclear Waste Partnership LLC. Other leadership roles at BWXT included Site Safety and Training Manager for Paducah cleanup contractor LATA Kentucky and Senior Project Director for Nuclear Fuel Services. LAS VEGAS, Nev.—We are pleased to report that our N3B team on the Los Alamos Legacy Cleanup Contract yesterday declared transition complete and DOE has accepted that declaration. Our team will officially begin operations on Monday. Congratulations to Christine Gelles, Katie Roberts and the rest of the L&A team who tirelessly supported transition over the last 97 days. We are ready to bring the full capabilities of our board and team to support the success of this project as we enter the operational phase. As always, our company values will be front and center for all members of our team. LAS VEGAS, Nev.—Longenecker & Associates, Inc. announced today that Craig Ferguson, a senior executive with broad experience across the Department of Energy’s national laboratories, the nuclear weapons complex and the U.S. Navy, has joined the company as Group Vice President for Mission Assurance. The NNSS protective forces contract is led by SOC and includes L&A as an integrated subcontractor in charge of quality assurance, contractor assurance and ES&H activities. The LLCC contract is led by Newport News Nuclear BWXT-Los Alamos, LLC (N3B) and includes L&A as a critical subcontractor with a role supporting quality assurance, contractor assurance and other functions. Since 2015, Craig has been a highly sought-after independent consultant in the mission assurance and project management field. Prior to that, Craig served as Associate Lab Director of Infrastructure and Safety at the SLAC National Accelerator Laboratory, among a series of high-level posts at the Stanford-run Laboratory. Before joining SLAC in 2008, Craig’s prior posts include Environment, Health, Safety and Quality Director at the Thomas Jefferson National Accelerator Facility, Environment, Health and Safety Director for Enriched Uranium Restart Operations for BWXT Y-12 at the Y 12 National Security Complex and Manager of Licensing and Safety Analysis for the Babcock and Wilcox Naval Nuclear Facility Division. Craig also spent nearly a decade in the U.S. Navy as a nuclear-trained engineering laboratory technician and supervisor with various positions, including nuclear plant operator on an aircraft carrier, nuclear repair supervisor for a fast attack submarine squadron, and department supervisor of a nuclear support facility. Craig holds Project Management Professional, Certified Health Physicist, and Certified Safety Professional credentials and an MS in Safety Sciences. Founded in 1989, Longenecker & Associates leverages more than 25 years of experience throughout the nuclear security and cleanup enterprise to improve mission performance, deliver capital asset projects to schedule and budget, implement effective governance approaches and develop targeted business strategies for both large and small businesses. Click here to view official press release. LAS VEGAS, Nev.—Longenecker & Associates, Inc. is proud to be a part of the Newport News Nuclear BWXT-Los Alamos, LLC (N3B) team selected by the Department of Energy in December for the Los Alamos Legacy Cleanup Contract. L&A is a critical subcontractor on the N3B-Los Alamos LLC team, with a role supporting quality assurance, contractor assurance and other functions on this important project. The N3B team is a joint venture led by Stoller Newport News Nuclear, part of Huntington Ingalls Industries Technical Solutions division, with partner BWXT Technical Services Group, a subsidiary of BWX Technologies, Inc. In addition to L&A, Tech2Solutions (T2S), a joint venture between TetraTech and Sealaska Technical Services, is also a critical subcontractor to the team. The $1.39 billion contract has a base period of five years, an Option 1 period for three years and an Option 2 period for two years, with a total period of performance of up to 10 years and three months. Since its inception in 1943 as part of the Manhattan Project, LANL’s primary mission has been nuclear weapons research and development. The mission of the Department of Energy’s Office of Environmental Management’s (DOE/EM) is to characterize and remediate contaminants in the environment; decontaminate, decommission and demolish process-contaminated facilities; and manage and dispose of legacy transuranic wastes, thereby reducing risks to the public, workers and the environment associated with legacy material, facilities and waste sites. Longenecker & Associates, Inc. announced today that Michael Kluse has been named to the company’s Strategic Advisory Board. Kluse is an independent consultant who most recently served as Director of Pacific Northwest National Laboratory, operated by Battelle for the Department of Energy, and as a Senior Vice President of Battelle. Kluse served as PNNL director from 2007 to 2015. Kluse joined Battelle at its Columbus, Ohio corporate headquarters in 1976 as a defense and space systems research scientist. Prior to becoming the Director of PNNL, Mr. Kluse served as Vice President of Battelle’s Defense Engineering business and Vice President/General Manager of Battelle’s Navy Sector. He moved to Richland, Wash. in 1997 to lead PNNL’s national security directorate. Longenecker & Associates, Inc. announced today that Robert Card has been named to the company’s Strategic Advisory Board. Card is an independent consultant who most recently served as Chief Executive Officer of SNC Lavalin. Prior to joining SNC Lavalin, Card served as the President of Energy, Water and Facilities Division at CH2M HILL Companies, Ltd. and previously held a number of key executive positions at the company, including President of Facilities & Infrastructure and President and Group Chief Executive of Government, Environment, Nuclear. Card also served as Under Secretary of Energy from 2001 to 2004. Prior to his nomination, he spent his entire career with CH2M Hill, eventually serving as President of Kaiser-Hill, the joint venture responsible for the closure of Rocky Flats. Longenecker & Associates, Inc. announced today that Dr. Laurie Judd has been promoted to Vice President, Corporate Programs. Judd joined L&A in 2015 from NuVision Engineering, where he was Vice President for Government Programs. The U.S. Department of Energy’s National Nuclear Security Administration (NNSA) has selected SOC LLC for award of a contract for security protective force and system services at the Nevada National Security Site (NNSS) and the NNSA Nevada Field Office (NFO) operated facilities. The contract has an estimated value of $202.94 million over 5 years if all options are exercised. SOC LLC will provide security related work at the NNSS and for NFO operated facilities in North Las Vegas and Nellis Air Force Base. This includes facility protection, patrol services, and protection of nuclear materials associated with the national stockpile stewardship experiments and criticality safety training conducted at the NNSS. Award date of this contract is May 30, 2017, with transition completion on July 31, 2017. SOC LLC teamed with Protection Strategies Inc. (PSI), Longenecker and Associates, and MCH Corporation. Under this arrangement, PSI will provide performance testing and assessment and Human Reliability Program support. Longenecker and Associates will provide services in the area of contractor assurance and Environment, Safety and Health. MCH Corporation will provide IT services support. Longenecker & Associates, Inc. announced today that Christine Gelles has been promoted to Senior Vice President for Operations. Gelles joins L&A Senior Vice Presidents Keller Staley and Martin Schneider to complete L&A’s senior management team in support of CEO Bonnie Longenecker and President John Longenecker. Longenecker & Associates, Inc. is proud to be a part of the National Technology & Engineering Solutions of Sandia (NTESS) team that was selected by the National Nuclear Security Administration to manage Sandia National Laboratories. Roberts has more than 16 years of environmental compliance and technical experience related to regulatory compliance, including 11 years of experience in New Mexico managing, coordinating and communicating between State and Federal agencies (EPA, DOE), New Mexico Congressional delegation, State legislators and a wide range of stakeholders, including local Indian Pueblos. Most recently, Roberts served as Director of NMED’s Resource Protection Division, which performs oversight of four NMED Bureaus—Hazardous Waste, Solid Waste, Petroleum Storage Tanks and DOE-Oversight. In this capacity, Roberts successfully negotiated the 2016 Compliance Order On Consent (Consent Order) for Los Alamos National Laboratory legacy cleanup with the Department of Energy. Schneider joined L&A in 2015, most recently serving as Group Vice President for Environmental Management Programs. In his Senior Vice President role, Schneider will continue to oversee the management and growth of L&A’s Environmental Management portfolio in addition to expanded corporate governance and business development responsibilities. Mr. Mara has more than 40 years of experience in national laboratory operations, engineering, and program management. Mr. Mara served from 2009 to 2016 in the University of California Office of the President in the role of Associate Vice President for Laboratory Programs. In this role, Mr. Mara was responsible for UC oversight of the scientific and technical programs at the three UC connected laboratories LBNL, LANL, and LLNL. From 2012-2014, Mr. Mara also served as Vice President Laboratory Management, and was Executive Board Member for the Los Alamos National Security LLC and Lawrence Livermore National Security LLC Boards of Governors. From June 2006 to July 2009, Mr. Mara served as LANL Principal Associate Director for the Nuclear Weapons Program where he was responsible for directing LANL’s efforts in support of the nation’s nuclear weapons program, an enterprise which represents over $1B of operating and construction resources and approximately half of the laboratory’s programmatic resources. Mr. Mara joined LLNL in 1971, and held a range of major management positions including Associate Director for Engineering, National Ignition Facility Principal Deputy Project Manager, Weaponization Program Leader/Defense Technologies, and Nevada Program Leader -Program Manager directing field and engineering resources to execute underground nuclear tests and experiments at the Nevada Test Site. Mr. Lehew has more than 30 years of domestic and international experience in operations, engineering, management, decommissioning and environmental remediation with demonstrated experience in managing complex projects involving multiple sites, organizations, contractors and regulatory agencies. Mr. Lehew has extensive experience in major program management, including nuclear facility decommissioning, environmental remediation and construction. Mr. Lehew also has significant experience in nuclear reactor and nuclear facility operations, maintenance, start-up testing, emergency response, and readiness reviews. Mr. Lehew previously served as CH2M’s Senior Vice President, Global Operations Director – Environmental and Nuclear Market. Prior to that, he served as Senior Vice President, North America and Asia/Pacific Liabilities Management – Nuclear Business Group as well as President and Chief Executive Officer, Hanford Central Plateau Remediation Contract; Site Project Manager/Decommissioning Project Manager, Dounreay Nuclear Facility; and President and Site Manager, Miamisburg Closure Project – CH2MHILL Mound Inc.
Mr. Lehew is a graduate of the Colorado School of Mines, with a Master of Science in Ecological Engineering; the U.S. Navy Nuclear Power School, Master of Science (equiv.) in Nuclear Engineering; and the United States Merchant Marine Academy, Bachelor of Science in Marine Engineering Systems. Risk management has always been an important part of L&A’s daily operations at the project level and as the company grows, establishing the Corporate Risk Officer position will ensure that focus is maintained and enhanced, particularly when it comes to sharing lessons learned across the company and leveraging corporate resources. Gelles has spent nearly 20 years at the Department of Energy, most of which has been with the Office of Environmental Management. Most recently, Gelles served as Acting Deputy Assistant Secretary for Waste Management, a post she assumed after leading the Department of Energy’s efforts to stand up the EM Los Alamos Field Office and serving as interim manager of that office until September 2015. Rachel Pope graduated from Clemson University in 2014 with a Bachelor of Science degree in Chemistry. She has continued her education in the Environmental Engineering and Earth Science department, pursuing her Masters of Science in Environmental Engineering and Science with a concentration in environmental health physics and radiochemistry. Rachel evaluates the performance of engineered bentonite barriers under repository conditions, studying the effects of elevated temperatures on the diffusion of 237Np(V). Other studies include the effluent analysis of radionuclide transport through soil using field lysimeters as well as hematite surface complexation modeling using isothermal titration calorimetry. Rachel intends on graduating from Clemson University in December 2016 where she will pursue an industrial occupation as well as take the certified health physicist exam. Jamie Weaver is a PhD candidate in the division of Analytical, Environmental, and Radiochemistry in the Department of Chemistry at Washington State University, and is a PhD intern at Pacific Northwest National Laboratory. Her current research interests span the fields of nuclear chemistry, analytical methods for solid-state systems, glass science, archaeology, and ancient history. Ms. Weaver’s PhD dissertation project investigates the localized chemistry of 99Tc in nuclear waste glasses. In addition to this work she has collaborated on two studies that correlate the alteration of man-made ancient glass analogs to the modeling the durability of nuclear waste glasses. In 2015 she was awarded the Golding Family Fellowship for Women in Science at Washington State University for her research on the alteration of ancient glasses. Stephanie Thornber has a background in Materials Science & Engineering, and graduated with First Class Honours from The University of Sheffield in 2013. Stephanie is now in the third year of her PhD at Sheffield University leading the development of glass-ceramic wasteforms consolidated by hot isostatic pressing for the disposal of Pu-residues at the UK’s Sellafield site. During the course of her PhD, Stephanie has received multiple awards for her research, presented at conferences as well as outreach events, and recently discussed her work at an All Party Parliamentary Nuclear Energy Group Meeting at the House of Commons in London, which discussed the UK’s plutonium policy where her research is a leading project. Timothy Ault is part of the Nuclear Environmental Engineering group at Vanderbilt University. Tim’s research focuses on the assessment of environmental impacts of nuclear fuel cycles, including both low and high-level radioactive waste, resource, and radiological impacts. His dissertation topic is a comparison of the environmental impacts from thorium- and uranium-based closed-recycle nuclear fuel cycles, which integrates fuel cycle and reactor simulations with environmental metrics. He has also conducted work in the areas of decision analysis and technology readiness assessment for nuclear fuel cycle applications. Tim has authored or co-authored more than twenty journal and conference papers, and has also contributed to over a dozen technical reports for organizations including the US DOE, Europe’s OECD-NEA, and the Electric Power Research Institute. He has also interned at and collaborated with both Oak Ridge and Idaho National Laboratories. Luke Boast is a third year PhD student at the University of Sheffield, working within the Immobilisation Science Laboratory (ISL). His research is funded through the Nuclear Decommissioning Authority (NDA) and focuses on developing an understanding of the waste and matrix interactions during thermal treatment of plutonium contaminated materials (PCM) found at the Sellafield site (UK). Luke is currently working with Kurion at the Sellafield site, providing operational support and assistance with glass formulations for a number of melt trials. Prior to his PhD, Luke gained a first class honours degree (BEng) from Swansea University in Materials Science and Engineering. During which he spent a year working for ALSTOM (Switzerland), on material related problems mainly in the hot gas path of modern gas turbines. Luke enjoys playing tennis in his free time. Highlights include, captaining Swansea University tennis team and representing Sheffield University at the 2014 varsity tournament. Dr. Cook is an independent consultant who previously served as the Deputy Administrator for Defense Programs at the National Nuclear Security Administration. Appointed to the position by President Barack Obama, Dr. Cook was sworn in as NNSA’s 5th Deputy Administrator in June 2010. He was responsible for managing the U.S. nuclear security enterprise of laboratories and manufacturing facilities. Prior to joining NNSA, Dr. Cook served as Managing Director and Chief Executive Officer of the Atomic Weapons Establishment in the United Kingdom from 2006 to 2009. In this capacity, he was accountable for AWE’s performance on the contract with the UK Ministry of Defence, which includes support of the UK Trident warheads and development and sustainment of capability in nuclear weapon design, engineering development, manufacturing, qualification, assembly, transport, support in service, and finally, decommissioning, dismantlement, and disposal. From 1977-2005, Dr. Cook worked at Sandia National Laboratories in Albuquerque, New Mexico. Notably, from 1999-2005, he was Director of the MESA Program Center, accountable for design and construction of the Microsystems and Engineering Sciences Applications (MESA) complex. In 2003, he assumed Program Director responsibilities for Sandia’s Infrastructure Program and for Sandia’s Safeguards and Security Technologies Program. Mr. Lind is Managing Partner of Berkshire Bridge Capital, LLC an investment bank specializing in Divestitures of privately held companies, Acquisitions, Strategic Alliances, Joint Ventures and the Private Placement of Debt and Equity (FINRA/SEC licensed Broker Dealer, member SIPC). Mr. Lind frequently volunteers his time as a judge for business plan competitions throughout Nevada (Sontag Award, NCET etc.) and remains connected through international conferences to clients and consultants throughout the world. Mr. Lind has 35+ years of financial experience including “bulge bracket” investment banking with Lehman Brothers (MD), venture capital investing with SAIC Venture Capital Corporation (MD & board member), corporate management with Rockwell International (Corporate Development- one of thirteen corporate officers) and commercial banking. Currently Mr. Lind serves as a director on the board of Virco Manufacturing (VIRC) and was a director on the Yosemite Conservancy’s Board of Trustees. He served as a founding director for the Nevada Capital Investment Corp. from 2011- 2012 ($50 million state fund). In 2010 Mr. Lind supported UNLV with the Clean Energy Initiative (an unsolicited grant request) and co-chaired The Clean Energy Forum which brought Elon Musk, Jon Wellinghoff and other noted ‘thought leaders’ to the UNLV conference. Prior to Berkshire Bridge, Mr. Lind worked at SAIC’s Venture Capital Corp, a $1 billion fund, where he oversaw new investment activities and co-managed a portfolio of approximately 68 early stage companies. He was a board member/observer for nine companies located in the U.S., Canada, Ireland and France. During the late 1990’s he served as an independent consultant to SAIC and assisted the company with the acquisition of Bellcore Labs (renamed, Telcordia). Mr. Lind then sold Bellcore’s crystal growing wafer fab to Corning and established “Tellium” in a technology commercialization transaction (company went public in 2001 with an initial market cap in excess of $1.1 billion). From 1994 to 1997 Mr. Lind was one of Rockwell’s thirteen corporate officers and served as Head of Corporate Development where he had responsibility for Mergers and Acquisitions, Technology Commercialization and New Business Ventures. During that time he led more than 25 transactions aggregating more than $4 billion in value. Prior to Rockwell, he was a Managing Director of Lehman Brothers Investment Banking, where he worked from 1983 to 1994. As a generalist investment banker Mr. Lind provided advisory services and debt and equity financing to large corporations located in the Southwest. His clients included Lockheed, Southern California Edison, Nevada Energy, Pacific Enterprises (Southern California Gas), Southwest Gas, Arizona Public Service, ARCO, Oxy, Unocal, Hilton, Disney, MCA, International Lease Finance and other large companies. Mr. Lind is a retired US Navy Captain and was awarded two Navy Commendation Medals. Mr. Lind was selected to attend the Naval War College in Newport, RI where he studied Defense Economics; later, he worked for Office of the Chief of Naval Operations during the budgeting process. He received a B.A. in Economics from UCLA and an MBA from the University of San Francisco, where he graduated first in his class. Mr. Lind has been married to Melody Lind for 43 years and is an avid hiker and skier. Mr. Sandlin has more than 35 years of broad-based leadership experience in development and administration of public and private contracts and business systems. He has supported projects and programs with annual budgets ranging from $150M to $600M. He is recognized as a subject matter expert in the development and implementation of innovative strategies to effectively and efficiently achieve performance-based project delivery. He has developed and managed complex contracting and procurement programs for the Department of Energy and multiple DOE sites. These changes resulted in significant cost reductions and accelerated schedule performance to reduce risk to the worker, public, and the environment on DOE projects. Mr. Sandlin’s innovative contract, subcontract, and procurement management expertise have been instrumental in achieving federal and private sector performance improvements and project/operational cost reductions.